Welcome to the latest and greatest in elevated home design. 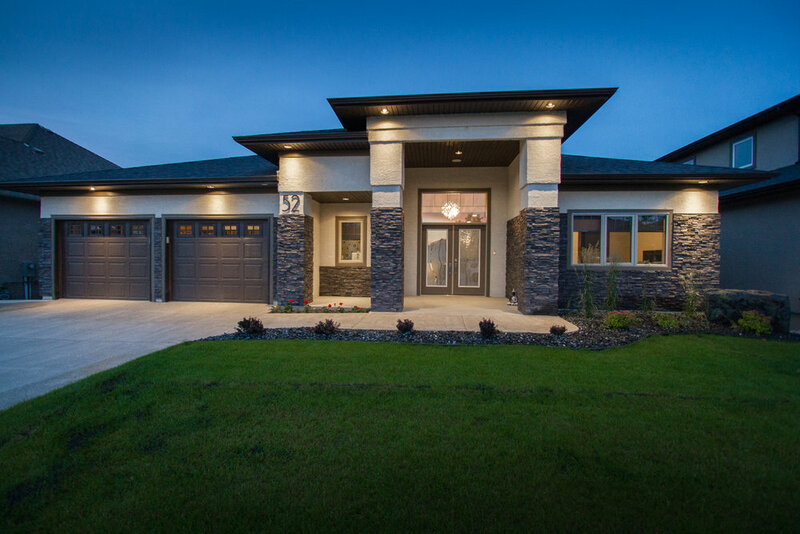 This fully customized home has over 3500 sqft of state-of-the-art living space, with attention to detail that will impress everyone! Located on massive lakefront lot on an exclusive cul-de-sac in prestigious Bridgwater Lakes, and only a 5 min walk to the coolest kids park & splash pad in the city, or 2 min drive to shopping & dining in the rapidly expanding Bridgwater Centre, the location couldn’t be better. Built for families and entertainers alike, this home features the largest master-chef kitchen I’ve seen in my career, with a massive 10x3 island, 5-burner gas cooktop, wall oven, and industrial style fridge, all wrapped in buttery granite and tile. The views from the dining room are impeccable! The bedroom layout is exactly what you want featuring a fully loaded principal bedroom on one wing, and the two other stately upstairs bedrooms located on a wing at the other side of the home. The principal bedroom has stunning views, a massive walk-in closet, and well-appointed bathroom including a shower with body jets & rain shower. The two upstairs bedrooms share an equally well-appointed Jack and Jill bathroom, and there is a third powder room for guests. The fourth bedroom is in the lower level and has its own luxurious bathroom. 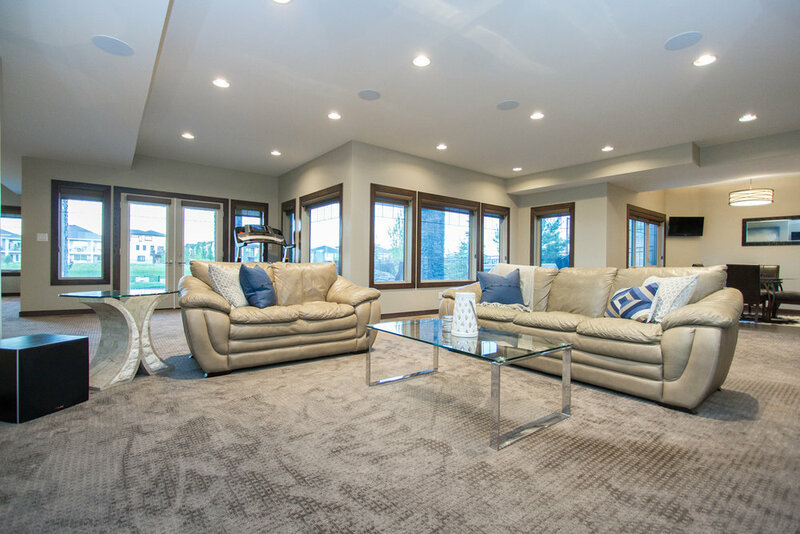 The enormous walk-out basement was fully finished by the builder and features a massive 4th bedroom, wet bar, flex room, media area, plus structural wood flooring and massive windows that overlook the yard, lake and 8 person hot tub. 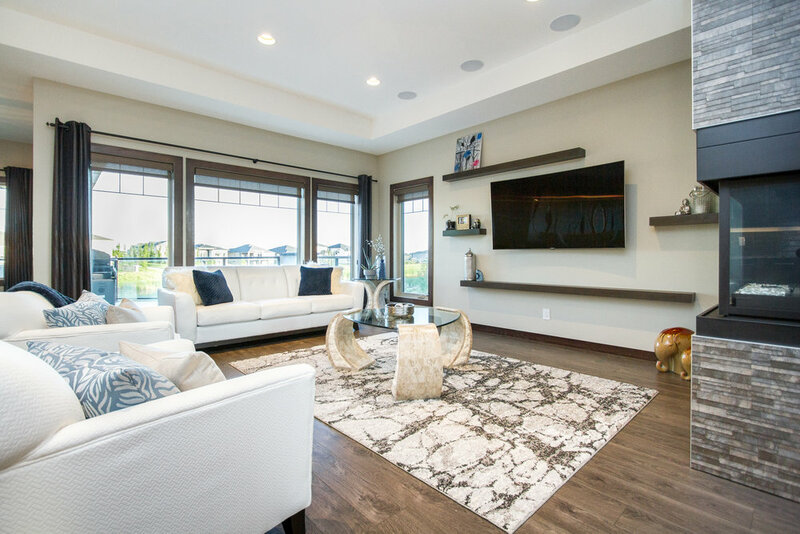 This home is wired for CONTROL4, and you can run everything from the music throughout the home, to the heat/cooling, in-ground sprinklers, alarm, from your phone. Welcome to the future! · Oversized triple attached garage with 3 indoor parking spots--very rare in the area! · Fully wired for CONTROL4, which runs the home seamlessly and efficiently through a smart phone application. Operate heating, cooling, audio, lighting, in-ground sprinkler and alarm from anywhere around the world. · Includes complete speaker package throughout home. · Custom wallpaper and feature walls designed/hand-picked by the design team at Interior Illusions, décor paint tones throughout. · All cabinetry in the home is from the Maple Thunder Collection, custom made by Kitchen Aid. This is one of the one of the most elaborate and grand cabinetry packages in the city of Winnipeg. · Kitchen Aid 5-burner gas cook-top, built-in microwave, industrial-style Electrolux fridge, Frigidaire professional series dishwasher. · Preferred bedroom plan, with the principal bedroom set to one side of home in private suite-like area, with commanding views of the massive lake lot. · Principal bedroom has a large walk-in closet, fully wired speaker package, spa-like en-suite with tiled/glass shower with body jets & rain shower, and a double vanity set in granite. · The other two stately main floor bedrooms are located in another wing across the home, and share a custom 4-piece Jack & Jill bathroom with equally high-end finishing work. · This home was built for entertaining! 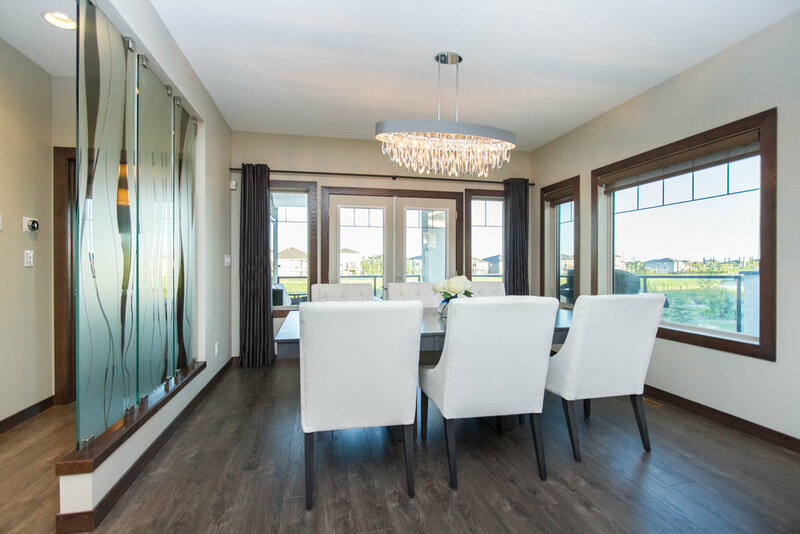 · The entire lower level was built and designed by the home builder, so every aspect of the home is consistent with the designers plans, and the upscale finishing work is carried through both levels. · Supports indoor-outdoor living with massive windows showcasing views of lake. · Access to hot tub for year-round enjoyment, and the massive stamped concrete patio, huge lot, and firepit for three-season entertainment.